It’s a jazz-heavy weekend and unless you can capture live moments on your TIVO, you might have some tough choices to make. Pretend you are in New York and this is just the daily grind. It’s Bryan Nichols week, sort of, as the young master of improvisation and composition leads three bands starting tonight (1/22) at Café Maude, where he is joined by Mike Lewis, Adam Linz and Sean Carey. 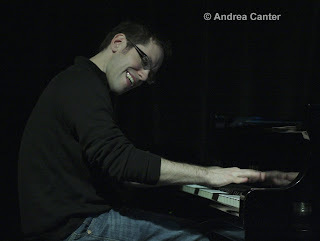 Tomorrow (1/23), he leads of a “Jazz Innovations” night as part of MacPhail’s Spotlight Series, this time in trio format with Linz and JT Bates. The Paul Renz Quintet will do the second set, making this a real “must see” night of modern music, featuring new compositions from both leaders. With regular drummer JT Bates behind the trapset, the Bryan Nichols Quartet surfaces again on Wednesday (1/27) at the Artists Quarter. (If that’s not enough Bryan, and I think there could never be too much, he’ll be with the Kelly Rossum Quartet next Saturday for Late Night at the Dakota—1/30). The Artists Quarter adds to the decision-making dilemma this weekend by bringing in two artists for one night each. 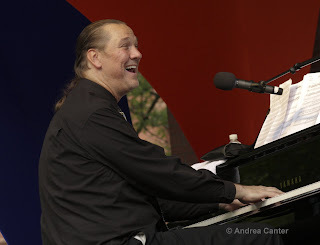 Encyclopedic sage and Tatumiffic virtuoso Jon Weber returns to his home away from home as a presentation by the St. Paul Winter Carnival, tickling and taunting the keys at the AQ tonight (1/22) with an early 8 pm start. Saturday night (1/23), the AQ hosts another reunion of the Illicit Sextet. One of the big names in area jazz in the early – mid 90s, the IS took a fifteen-year vacation with only one personnel change, reunited at the AQ last summer. It was such fun, they had to do it again. Maybe we will stop calling these gigs “reunions” and just call them fabulous? The Illicit Sextet is Chris Lomheim, David Roos, Tom Pieper, Paul Harper, Steve Kenny and Nathan Norman. And the Dakota has its own enticements, again a different flavor each night of the weekend. Folk icon Judy Collins is back tonight (1/22) for the second set of shows. If you are old enough to remember the 60s, you are young enough to check out how well time has treated Judy and her material. Now 70, the voice has held up remarkably well, and her sense of humor and storytelling make for a mesmerizing evening. (If you heard her show at O’Shaughnessy about five years ago, forget it, must have been an off-night. Erase it at the Dakota this weekend.) Saturday night brings in a Minnesota icon, Cuban pianist Nachito Herrera, back for his near-monthly meltdown. Stick around for Late Night (1/23) with the Enormous Quartet led by free-wheeling saxman Chris Thomson. 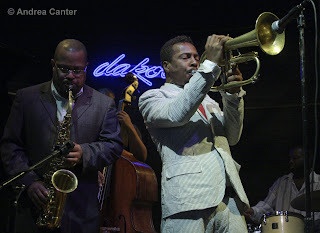 Big things keep happening at the Dakota, with trumpet king Roy Hargrove and his quintet Sunday and Monday nights (1/24-25). Roy is enough to hear by himself but he always has a hot young band—this time with Justin Robinson returning on alto, Montez Coleman back on drums, and new recruits Aleen Saleem on bass and the remarkable Jonathan Batiste on piano. Roy loves the Dakota, obvious in every note, and fortunately we seem to get him to town about every six months. The other “really big show” in town this coming week is the live recording session of Pete Whitman’s X-Tet at the AQ, starting Thursday night (1/28) and continuing a second night (1/29). Aside from gathering ten of the area’s finest artists, this gig will also welcome back Kelly Rossum who has been living and playing in New York since September. Lots of other gigs as always: On the vocal front, start your week sweetly with Maud Hixson and guitarist Dave Singley at the Downtowner Woodfire Grill in St Paul (1/22) and Honey (1/23); Sophia Shorai at the Nicollet Island Inn (1/22); Erin Schwab at Hell’s Kitchen (1/22); Charmin Michelle at Crave in the West End (1/24) and Fireside Pizza (1/25 & 1/27); Nichola Miller at Tickles (1/22) and Hell’s Kitchen (1/23 & 1/27); the swinging voices of Route 3, led by tubaist Ralph Hepola, at the Bloomington Center for the Arts on Sunday afternoon (1/24); Debbie Duncan and Mary Louise Knutson at Camp Bar (1/26); Katie Gearty with Vital Organ at Hell’s Kitchen (1/26); Christine Rosholt at Honey (1/27). More instrumental jazz: JoAnn Funk and Jeff Brueske at the St Paul Hotel Lobby Bar (1/22-23); Peter Schimke and Irv Williams for Happy Hour at the Dakota (1/22); the Benny Weinbeck Trio at D’Amico in the Chambers Hotel (1/22-23); George Cartwright in a double set highlighting compositions funded by a Jerome grant at Studio Z (1/22-23); the Zacc Harris Trio at the Riverview Wine Bar (1/24); Fat Kid Wednesdays at the Clown Lounge (1/25); the Cory Wong Quartet followed by the Tuesday Night Band at the AQ (1/26); the Twin Cities Hot Club at Erte (1/27); the James Buckley Trio at Barbette (1/28). Coming Soon! More live recording with the X-Tet and Kelly Rossum at the AQ (1/29), the Lomheim/Linz/Hey Trio at the AQ (1/30); Bill Frisell at the Walker (2/6); Roberta Gambarini at the Dakota (2/8); Bob James and Keiko Matsui at the Dakota (2/9-10); the annual Bobby Peterson Tribute Weekend at the AQ (2/12-13); Debbie Duncan and Anthony Cox at the Dakota (2/12-13); Matt Slocum CD release at the AQ (2/19-20); Ahmad Jamal at the Dakota (2/21-23).